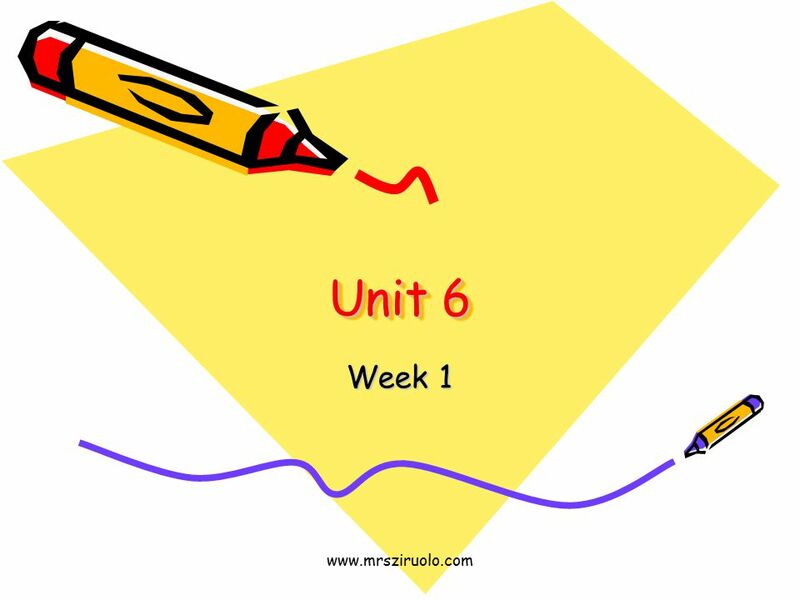 Www.mrsziruolo.com Unit 6 Week 1. www.mrsziruolo.com Read the story Fern and Freddy have always been best friends. So Fern was sad when she couldn’t find. 3 www.mrsziruolo.com Fern went from one end of the pond to the other. But she couldn’t find any clues. 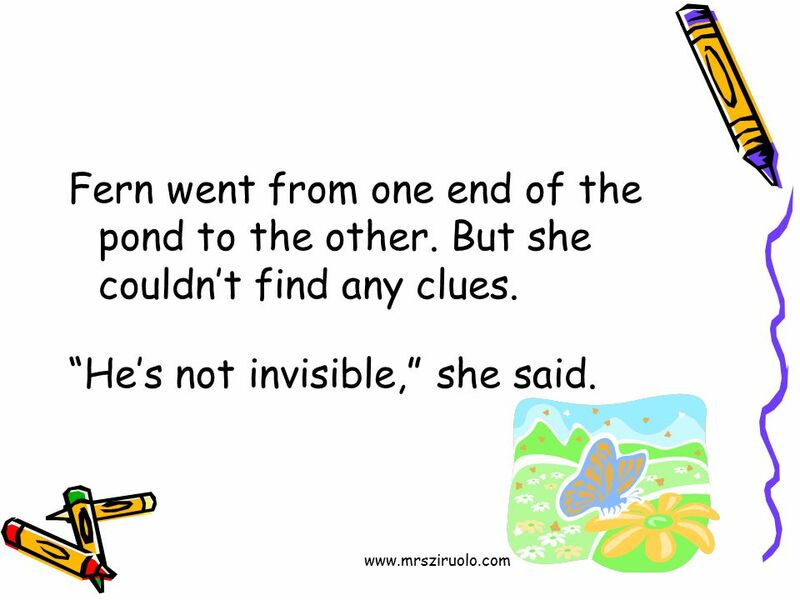 “He’s not invisible,” she said. 4 www.mrsziruolo.com Then Fern heard Freddy shouting. He was trapped in a web. 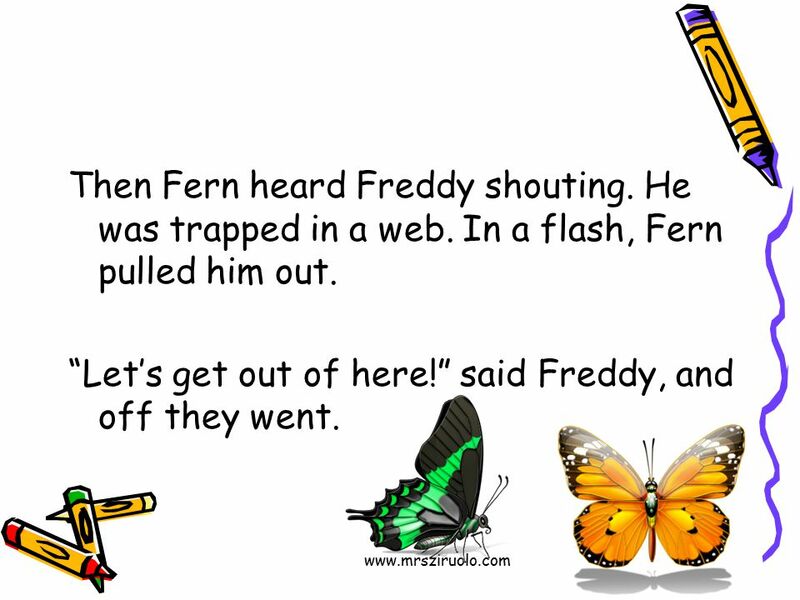 In a flash, Fern pulled him out. 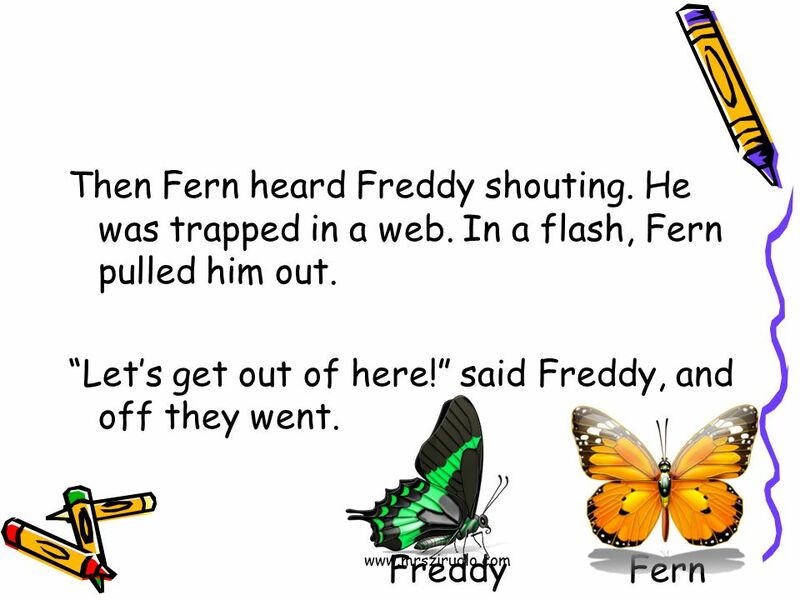 “Let’s get out of here!” said Freddy, and off they went. 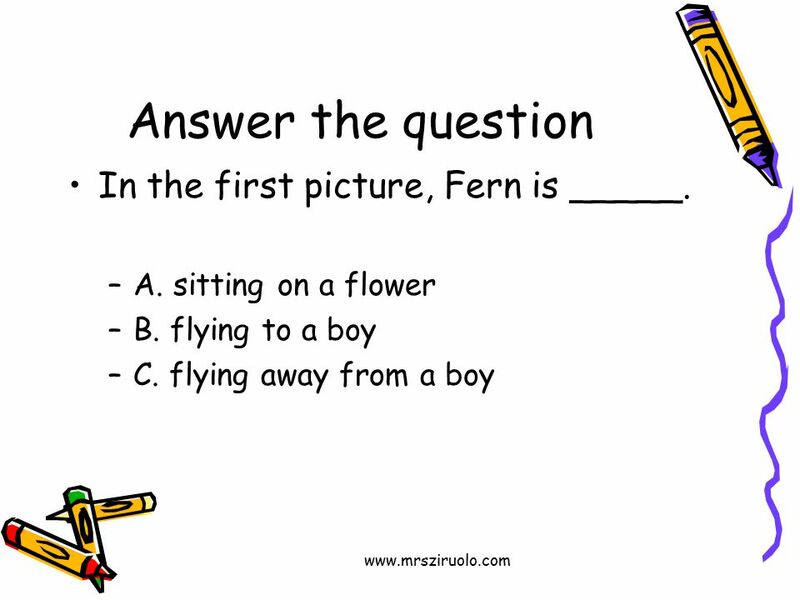 5 www.mrsziruolo.com Answer the question Fern is ______ for Freddy. –A. invisible –B. gone –C. 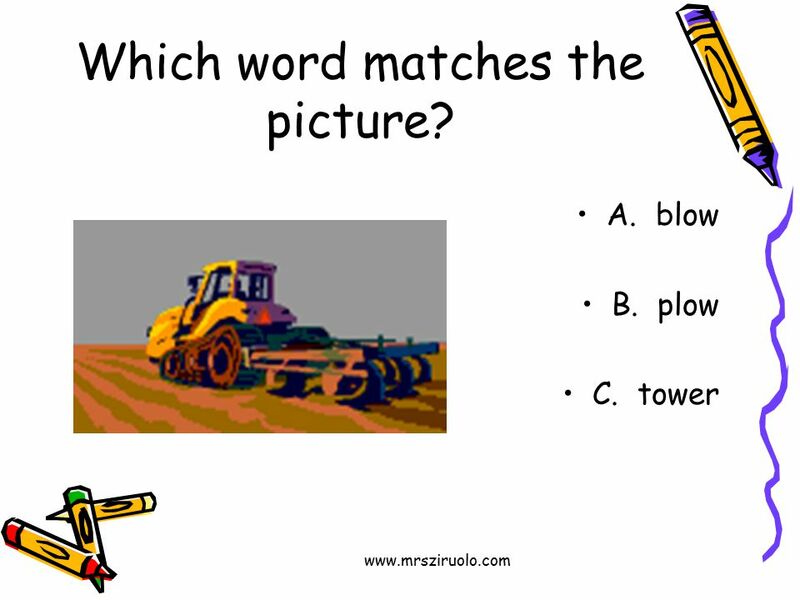 searching Reread the sentence with your answer choice. Does it make sense? 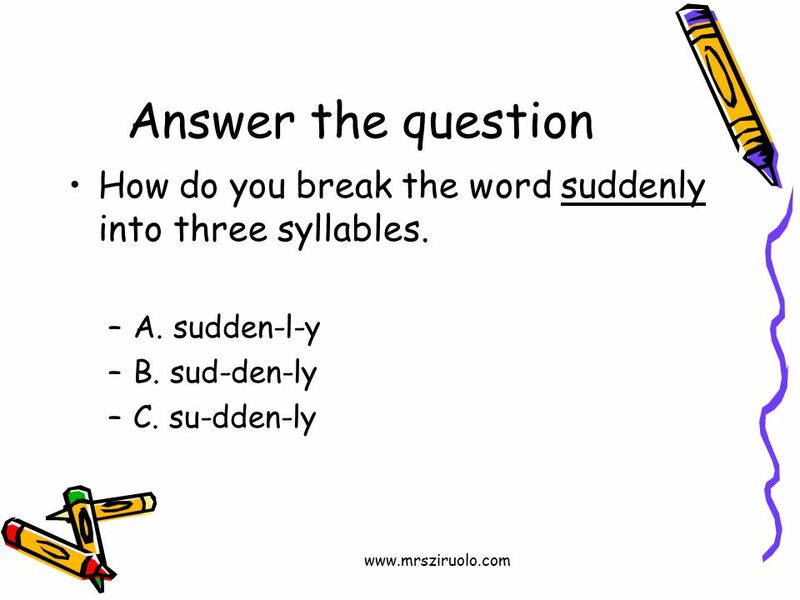 6 www.mrsziruolo.com Answer the question Read the dictionary entry. 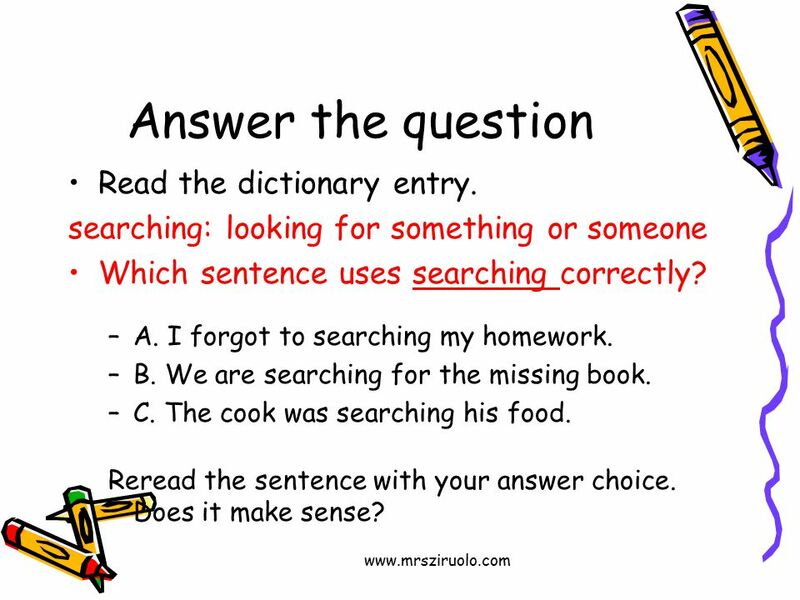 searching: looking for something or someone Which sentence uses searching correctly? –A. I forgot to searching my homework. –B. We are searching for the missing book. –C. The cook was searching his food. 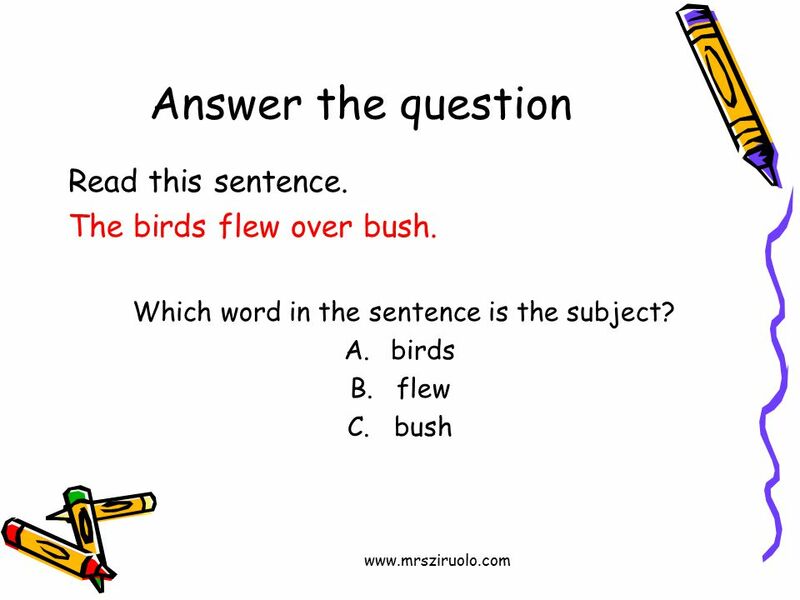 Reread the sentence with your answer choice. Does it make sense? 7 www.mrsziruolo.com Answer the question In the first picture, Fern is _____. –A. sitting on a flower –B. flying to a boy –C. flying away from a boy Let’s look back! 10 www.mrsziruolo.com Answer the question In the second picture, Fern is _____. –A. sitting on a flower –B. flying to a boy –C. flying away from a boy Let’s look back! 11 www.mrsziruolo.com Fern went from one end of the pond to the other. But she couldn’t find any clues. “He’s not invisible,” she said. 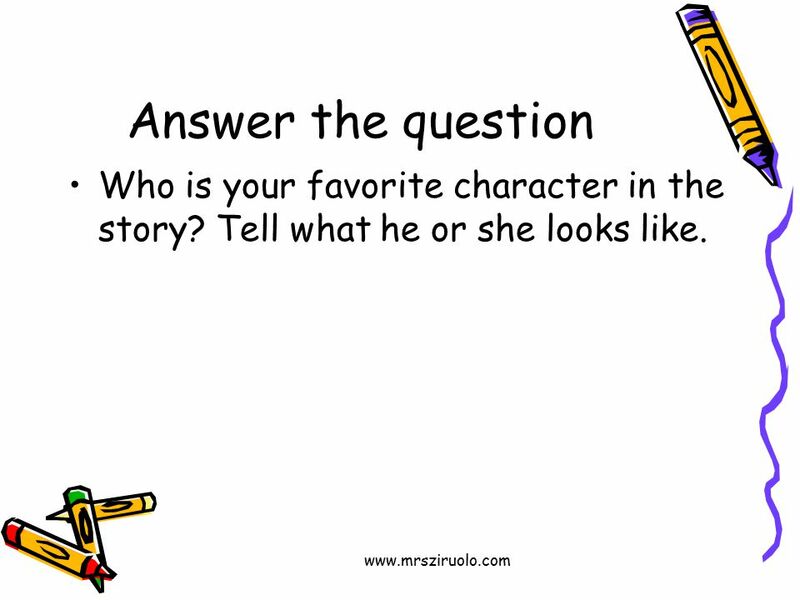 13 www.mrsziruolo.com Answer the question Who is your favorite character in the story? Tell what he or she looks like. Let’s look back! 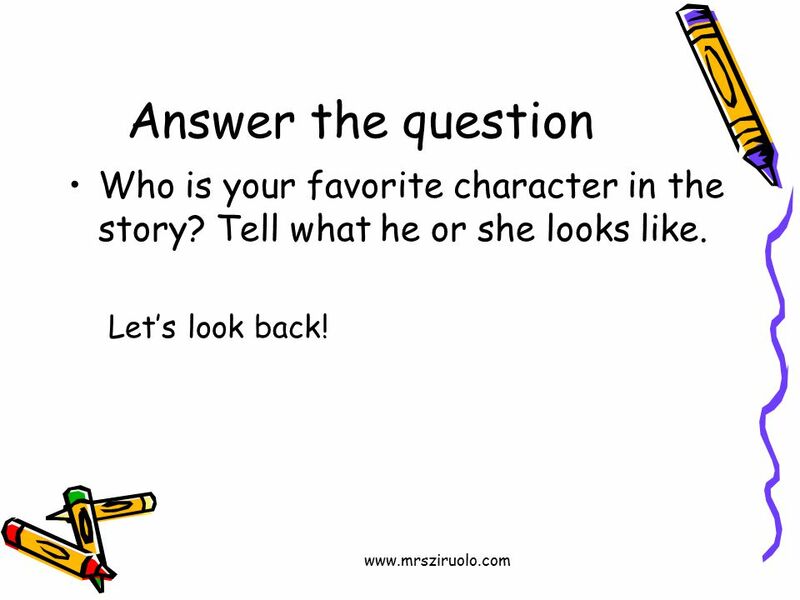 15 www.mrsziruolo.com Answer the question Who is your favorite character in the story? Tell what he or she looks like. 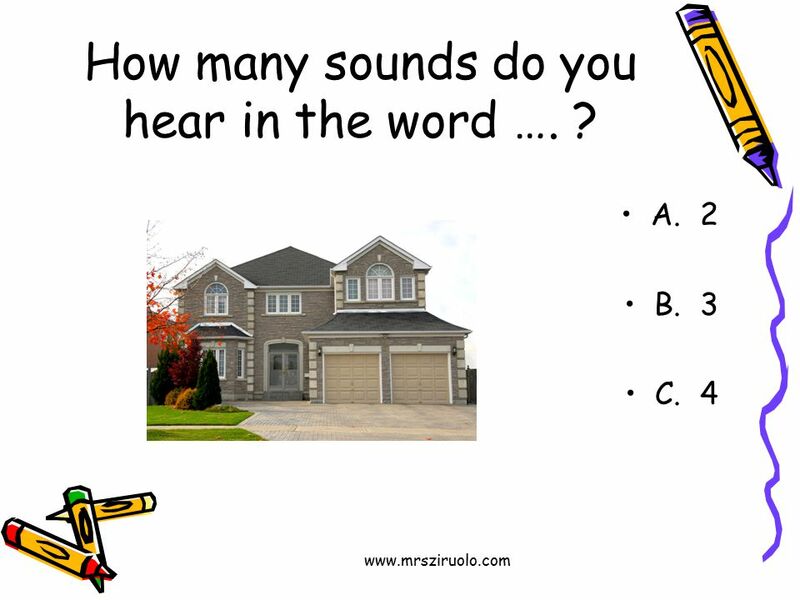 21 www.mrsziruolo.com Answer the question Read this sentence. 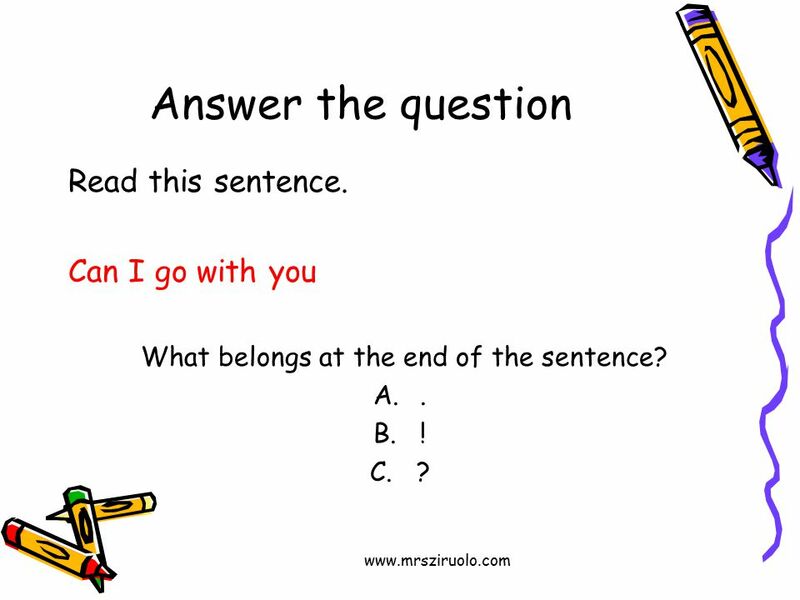 Can I go with you What belongs at the end of the sentence? A.. B.! C.? 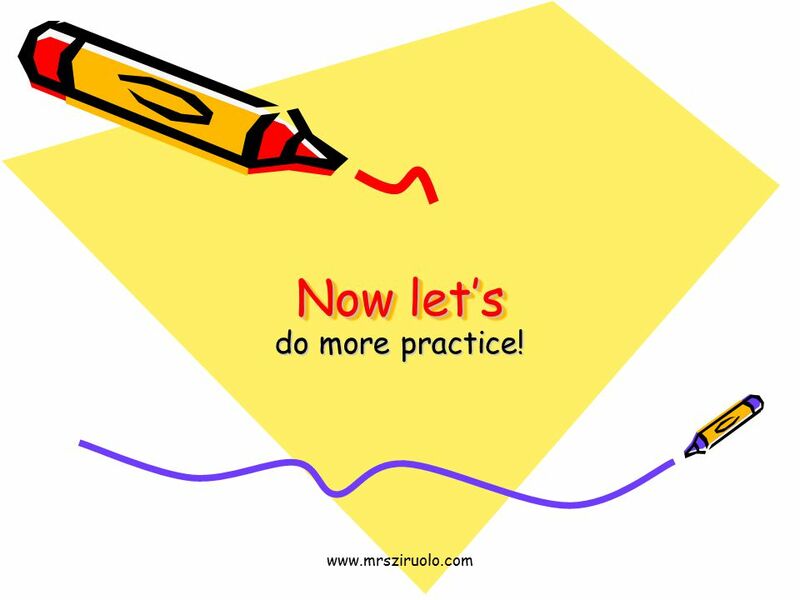 22 www.mrsziruolo.com Now let’s do more practice! 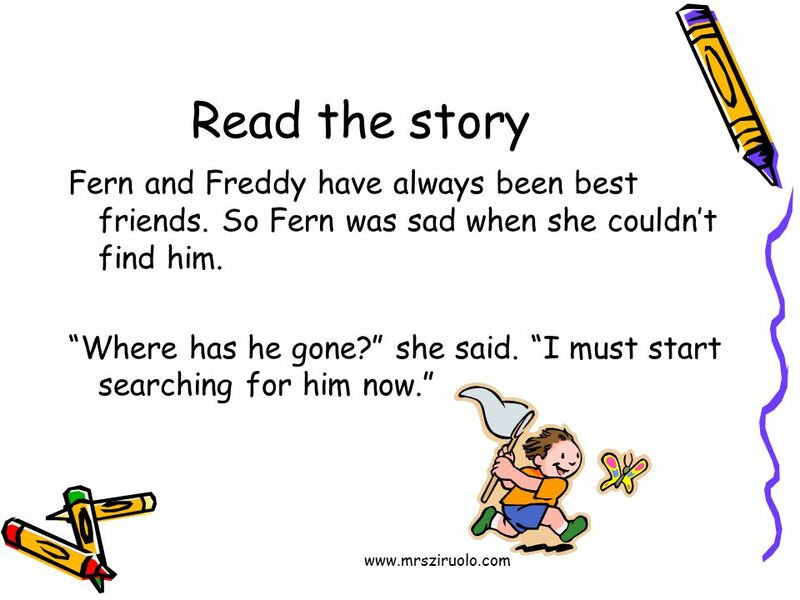 Download ppt "Www.mrsziruolo.com Unit 6 Week 1. www.mrsziruolo.com Read the story Fern and Freddy have always been best friends. So Fern was sad when she couldn’t find." Active Reading Strategies Making the Invisible Visible. Anti-Bullying Week 2014 Key Stage 1 - lesson activities Created with Helen Lambie 2014. How you can help your child with their reading homework. Mrs. Milleville’s Resource Room.